NOTE: TCAF IS NOT AT TULIP CITY OR PARK TOWNSHIP AIRPORTS. 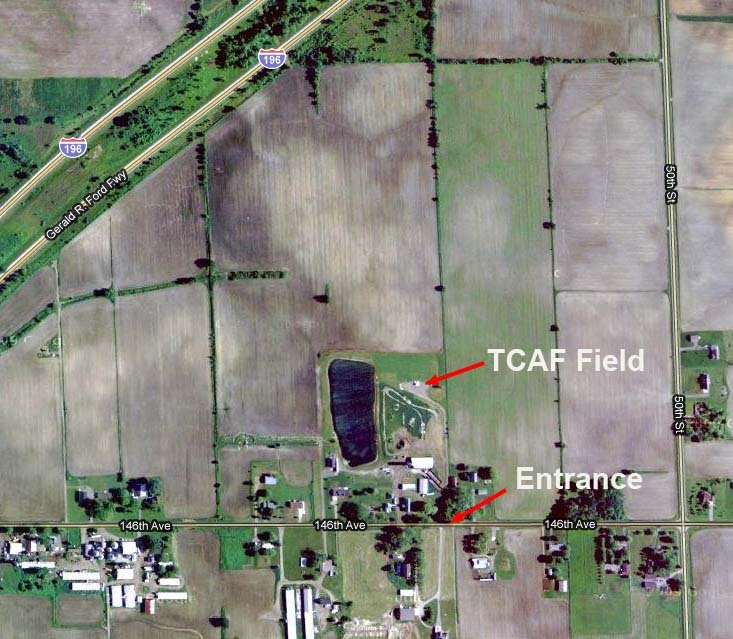 TCAF Field is located about 1/8th mile east of I-196 on 146th Ave. The driveway is on the north side of the road and marked with a white sign under a large willow tree. From Holland – take Waverly St (120th Ave) south to E48th ST which will turn into 146th Ave and turn left. Go approximately 3/4 of a mile to our drive on your left. From I-196 take the M40 exit (exit 49) and go north towards Holland. Turn right on Waverly St (120th) and follow it to E48th ST which turns into 146th Ave and turn right. Go approximately 3/4 of a mile to our drive on your left.